Pancreatitis refers to inflammation of the pancreas and is caused by activation of the digestive enzymes within the pancreas due to pancreatic damage or blockage of its outflow duct. This results in pancreatic auto-digestion, whereby the enzymes destroy the pancreatic tissue. Acute pancreatitis is defined as reversible pancreatic inflammation, while chronic pancreatitis refers to permanent changes in the pancreatic tissue. These two forms of pancreatitis cannot be differentiated clinically; although, clinical signs in acute pancreatitis are usually more severe than those seen with chronic pancreatitis. Acute pancreatitis can lead swiftly to systemic inflammation, shock and death and must be treated aggressively. Cats are more prone to develop chronic pancreatitis, but because the cause of the inflammation is usually unknown, it is referred to as “idiopathic” pancreatitis. Some risk factors, however, have been documented, including trauma, toxins, parasites and inflammation of other abdominal organs such as the liver and intestines. Unlike humans and dogs, cats with acute pancreatitis often do not present with signs of vomiting and abdominal pain. In severe cases when there is systemic inflammation, the cat may have a low body temperature and blood pressure, diarrhea and labored breathing. In contrast, cats with mild chronic pancreatitis may not show any clinical signs, or have vague signs such as anorexia, lethargy, dehydration and weight loss. Diagnostics that may be recommended include abdominal radiographs (X-rays), ultrasound, blood work including a complete blood count (CBC) and biochemical profile, urinalysis, urine culture and a feline pancreatic lipase immunoreactivity (fPLI) test. Radiographs are usually not very helpful in establishing a diagnosis of pancreatitis, but are important in ruling out other causes of disease. Abdominal ultrasound can be very specific in identifying pancreatitis, but the pancreas may appear normal in up to 65% of cats with pancreatic inflammation. Blood work can be normal or demonstrate diseases of other organ systems either unrelated to or caused by the pancreatitis. The fPLI test is a highly accurate test in diagnosing pancreatitis; however, the presence of an abnormal fPLI test does not definitely rule in pancreatitis as the sole cause of the clinical signs. This is an important concept, as resolution of the pancreatitis may not lead to resolution of the clinical signs. Currently, the combination of the above tests is usually recommended to obtain a presumptive diagnosis of pancreatitis. The only definitive way to diagnose pancreatitis is to obtain a biopsy via surgery or laparoscopy; although, many times the patient is too unstable to undergo anesthesia. Treatment is truly supportive in nature, and its aggressiveness depends on the severity of the pancreatitis. In severe cases, hospitalization is required for restoration and maintenance of hydration, control of pain and vomiting, nutritional support and possibly antibiotic administration. Unlike dogs and people, nutritional support is vital in cats as they can develop secondary liver disease (“fatty liver” or hepatic lipidosis) within a few days of inappetence. If the patient is not vomiting and accepts food, it should be offered orally. Otherwise, placement of a feeding tube is essential. If the patient is vomiting, a feeding tube that bypasses the region of the pancreas must be used. In less severe chronic cases, hospitalization may not be required if the patient is hydrated and not vomiting. Nutritional support is essential, and placement of a feeding tube for home use (esophageal or gastrostomy) may be required. Appetite stimulants may assist a partially anorectic cat to eat. 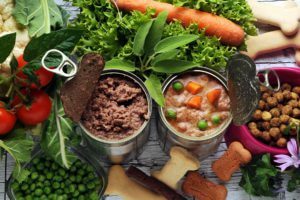 The use of a low-fat diet, as typically recommended in dogs with pancreatitis, has not been proven to be essential in cats, so offering the cat anything accepted is recommended. Prognosis is dependent on severity of clinical signs, degree of pancreatic tissue damage, duration of illness and the presence of concurrent disease. In uncomplicated cases, if nutritional support is instituted early, there may be no future recurrences of disease. Conversely, cats often develop chronic pancreatitis leading to persistent disease accompanied by vague clinical signs, as described above. As mentioned, an acute severe episode of pancreatitis can quickly lead to shock and death if aggressive treatment is not started promptly. Unfortunately, even with aggressive treatment, some patients may still die. Because of the complexity in diagnosis and unpredictability of response to treatment, suggesting a prognosis is difficult. In severe cases, hospitalization may be required for several weeks before the patient is stable enough to be discharged.